I could have browned them a bit more, but I like the contrasting colors and the flavor was just perfect. Yummy lunch dessert ready in a jiffy - who said muffins are only for breakfast! BTW, the Godrej Nature's Basket here, and they told me that this is an ordinary shop not the gourmet one!!! I am shocked - are we Thaneites now forced to face this kind of discrimination too? I gave him a yuck look and well....@#$! This is so bad! The Lokhandwala one seemed to be the same earlier, but a few months back they decked it up so I guess we are now in the gourmet category. I wrote two mails and no reply!! Where are you? Are you alright? Am glad you made these..fres cherries or not..they look scrumptious. I never knew cherries were dried. I've only seen the frsh ones and those in sugar syrup. 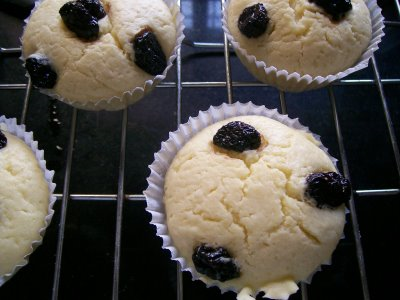 Yes, your muffins look lovely with cherries just about bursting from them.